That message you sent to a new prospect was one of 100 billion business emails that make up daily email traffic. Stop. Read the first sentence again. Note two key words: “business” and “daily.” The 100 billion statistic includes only business-related emails; Nancy asking Gran for her meatloaf recipe isn’t included. And that’s 100 billion per day – not per month, quarter or year. Sending and responding to emails is part of doing business, period. According to The Radicati Group, Inc., a technology market research firm, “the majority of email traffic (came) from business email” in 2013. And that traffic jam is going to get even more bottlenecked. By the end of 2017, business email is predicted to account for 132 billion messages per day and take up a larger percentage of the highway. “Consumer email traffic, on the other hand, is expected to decrease over the next four years….Consumers are now opting to use social networking sites, instant messaging, mobile IM, and text messaging for instantaneous communication with family and friends.” (Source: The Radicati Group, Inc) Bottom line: Nancy will text Gran for that meatloaf recipe, and you’ll still be sending emails to business prospects. I intentionally employed a bit of sarcasm in that first “no worries” headline, which I suggest you not replicate in your business emails. That may be obvious writing etiquette, but there are numerous not-so-obvious mistakes being made each day within those 100 billion business emails. In working with our business writing courses clients at Instructional Solutions, we’ve found that nearly 75% of email messages we review need a conclusion that is better matched to the strategic goal of the email. "Please let me know if you have any questions." "Please sign the training contract on page two and fax it back to me directly at 555-555-5555. I look forward to working with you to improve business email in your organization." That’s where Instructional Solutions comes in. Founded in 1998 by internationally recognized business writing trainer Mary Cullen, Instructional Solutions has delivered business writing courses to a wide variety of clients. These include DuPont, Ernst & Young, FedEx, PetSmart, Inc., The Nature Conservancy and the U.S. Army. So, yes, those emails you receive from some pretty familiar names just may have our business writing course stamp all over them. 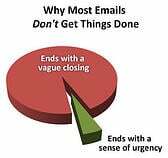 Before you hit "send" on another batch of emails, contact us to learn more about Instructional Solutions business writing courses.